Most examples of this streamlined (Brooklands style) racing car are the later type, which doesn't feature the open cockpit of this early, 1930s or 1940s, example. Minic toys were produced by the Tri-ang childrens toy manufacturer. The rubber tyres on this example are definitely showing their age, but will not be replaced as this would impact the toy's originality. 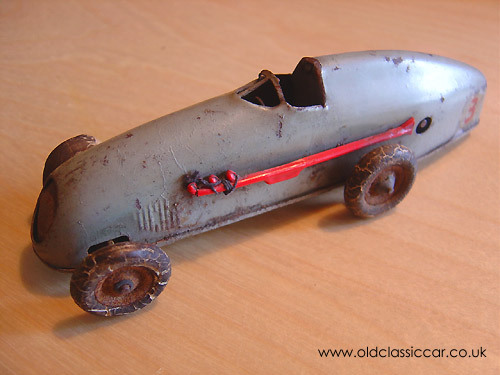 This example is also unusual in that it still sports its original side mounted exhaust pipe, usually the first thing to disappear when these toys were played with. Colour: grey, red exhaust, open cockpit and no driver.